Between the stinky economy and swine flu pandemic, I’d say things are looking a little dismal out there! Good grief! So what can we do to keep ourselves inspired to find the beauty in life? You know me, I like to celebrate the little things! When things get a little gloomy, I try to focus on the positives and create a list of things to be happy about in life. When I first start to make a list of happy things, I’ll admit I sometimes have a hard time finding 20 things. I get a far off, spaced out look on my face. But the more I think, the happier I get because I realize I DO have 20 things to be happy about! At least 20 things! And that in itself is reason to celebrate. I turn my mood right around by thinking of just 20 little things that make life beautiful for me. But, even if I could find only ONE thing, thinking about it would be a good way to focus on something positive amidst the craziness this world is dishing out right now. Oooh, how clever am I? DISHING OUT… mwahaa haa haa. OK. I’d blame it on the paint fumes. If I had started painting yet. Oh, stop. I’ll get to it. I have TWO WEEKS! New dishes!! For one lucky winner, A $100 Retail Value Gift Certificate to DaySpring for anything from their new Life Collection! Just a couple of days ago DaySpring sent me some very happy dishes from their new LIFE TO THE FULL COLLECTION! Lucky me! I am a white dishes girl but I was thrilled to find these beauties to mix in for some outdoor fun this summer. These really are lovely dishes and very well crafted — if you want some for yourself, you will NOT be disappointed! You could hang these on a wall or eat off of them, either way, they are gorgeous! There is no better time to celebrate LIFE TO THE FULL than right now. This collection would make a great Mother’s day gift, so for everyone here is a 20% off code for your next purchase! How do you enter this Happy Life giveaway? You can enter any of these three ways, or ALL THREE if you want three chances! 2) Share some little things via the comments that MAKE YOU HAPPY in spite of all this crazy Swine flu and economy woes. 3) And if you are a subscriber (or become one) of The Inspired Room, I’m given you an extra chance to win! You’ll find a secret code in your post. All you have to do is send an email to theinspiredroom@gmail.com with the word CODE in the subject line. Then tell me what the code is and you get another entry. You can subscribe via email right here! Or via RSS right here! The code will be in the posts next week as well so watch for it if you are just subscribing today! So, three chances (I’ll count every entry, so you may as well try for them all!) to win a $100 retail value (yes, a $100 retail value shopping spree!!!) of any Life To The Full Collection products from DaySpring! Want to see more of the Life to the Full Collection? Click here! PS. If your procrastination project goes wrong over the weekend, just take a deep breath and click The Magic Brush for a good laugh. Laugh WITH her. Not AT her. Really. I can so relate. oops…Mr. Linky didn’t work earlier, so if you still want to add a post here, feel free! Just make sure your link goes directly to a specific Beautiful Life post…and put a link back to The Inspired Room! I’m happy that my sister is bringing her family for a visit this weekend. And it makes me happy that we have the extra money to visit the grocery store and pick out whatever little treats we want. I bought fancy whole bean coffee, special bread for French toast, little treats for the kids, etc. So many families are stretched thin in this economy, watching every dollar, even forced to rely on help from food banks. I love the peace and quiet of my mornings. My family sleeping safely in their beds and me with my 1st cup of coffee. Great! I’m also always happy when I watch the KY Derby! When they sing My Old Ky Home… I cry, LOL! I feel happy to be from here and part of such an enduring tradition, I can’t wait until tomorrow! I am happy that I have a job I live in this economy. I teach kindergarten to 20 beautiful children and every day is an adventure! I am happy that I have my sweet puppy. He is such a loving little companion. The secret code is leomade. I have been thinking that I have a lot to be thankful for lately (and that makes me happy!). I feel so fortunate to still have a job. I am blessed by the ability of my husband and I to purchase our first home. My kiddos as school (I teach 1st grade) have taught me to have a positive attitude! They are so funny. Lastly, I am thankful for the ability I have to help others and do random acts of kindness. I’m an early riser…I mean early! And the weather here in the ATL is perfect right now…it makes me happy to work at the kitchen table with the back door open and the birds singing as the have breakfast at my birdfeeders! Robin Rane’ ~ All Things Heart and Homes inspiring blog post..Cinco de Mayo! Oh, I love the dishes! I like your thankful list Melissa. It’s amazing how many things to be thankful for we can take for granted each day. Thanks for reminding me to keep my eyes open. Thanks for sharing your list. It reminded me to focus on blessings and there really are so many! I love my early morning tea and oatmeal time on the porch with my puppies, I love getting phone calls from my husband, I love planting flowers, I love not watching TV (I still am not quite sure of all these swine flu details….and I love it!) BEAUTIFUL dishes! I too am a white plate girl…with fancy colorful serving pieces! Thanks for sharing the “small things” in life and reminding us how truly beautiful they are! After following the LPM blog this week about their Compassion trip to Calcutta – I’m so thankful for my home and how it is filled with my FAMILY! Kims inspiring blog post..Bring On The Romance!! Hearing my girls laugh!! Brings such joy to my heart. These dishes are beautiful, and although I also like white dishes, these would be great accent pieces. Great post and great reminders to take stock of all of the good things we have. I am thankful for two healthy kiddos, a husband that has the day off of work who is having the kids “help” make pancakes so that I can sip coffee and read your blog, a rainy day that is making everything that pretty spring green color. 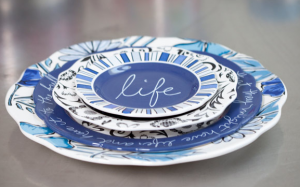 Beautiful dishes, what a fun giveaway! – Gary, my loving boyfriend and best friend, who has been with me through thick and thin, through cancer and transplant rejection, who still holds on tight to me when we sleep, like when we first met. – Clean water. After the swine flu outbreak (and trips to Mexico in the past), I filled up a glass of water and just looked at it and marveled about how I get good, clean, filtered water. We’re so blessed in America. – My job… I work with behaviorally challenged teenagers, and whenever I get an “F – YOU!” or some other such lovely sentiment, I remember that without me and my fellow co-workers, they wouldn’t learn how else to express themselves. They keep me sane, and sometimes drive me insane – but either way, when I’m at work, it all comes full circle. – And finally, the thing in this world that makes me the happiest: RANDOM ACTS OF KINDNESS. Whenever I see one, or get one, or give one, it never ceases to amaze me how darn cool people can be. Thanks for your post. It’s great! What a great idea! I had a horrible day yesterday and ended up at the thrift store and thought all night how amazing it was that a daisy pitcher and a pair of shoes from the thrift store could make such a difference in my attitude! Becky K.s inspiring blog post..A Beautiful Yard? What a fun post, and what a fun giveaway! Let’s see, whay makes me happy? Babies laughing, spring, fall, puppies snuggling, boys roughhousing… there are lots of things to be happy about, aren’t there? Terri Preasts inspiring blog post..Stop Moping! Smiling babies make me happy – after a night of crying and fussing it’s nice to wake up to a smiling baby boy! Watching our garden grow, knowing that it will help to feed our family makes me happy! Donna S.s inspiring blog post..Getting Things Done – Procrastinators Unite! I love to hear my small children sing songs about our savior. They have such sweet voices and sing with no reserve. Throw my name into the hat! What a beautiful morning in the South. I love spring! Living from a place of abundance, even though money is tighter than it’s ever been, makes me happy. Hosting friends in my home for simple meals (even potlucks!) and good times is wonderful! I love the dishes there just the right pop of color for summer. This week has been full of stress, but above all, and the only thing that matters, is that I found out that I’m going to be a mom! My hubs and I got our adoption license approval on Tuesday. That means we could be parents within the next month. This has been a three year process, so to be in this place, well, it’s almost a miracle. That’s something to celebrate! My children, my husband, spring flowers, our families, our home, our family life, our church, our friends, healthy bodies, healing bodies, a loving God…. Once I get started I could really have a long list! Things that make me happy are usually the simplest. Coffee with a good friend. A passionate kiss from my husband. A clean house. And those dishes…they are happy! Let’s see…things that make me happy lately. Our beautiful Iris that are in full bloom. My oldest daughter reading chapter books…yea. My 12th wedding anniversary this Sunday. Lunch with my best friend earlier this week. Simple things make me happy…my little granddaughter and her funny expressions, children who make me crazy but in spite of that they make me happy too, my hubby who always wants to give me everything. A phone call from a friend or a comment from a blogging friend makes me smile. I look outside and see all the beauty that God has created for all of us and am in awe. and the fact that when we saw that on a church sign, my husband is the one who made sure I saw it! Cathy Daviss inspiring blog post..Got S.O.A.P.? and I happy to have great places to go like here, for great inspiration. teresas inspiring blog post..Oh the Shame…. So much to be happy about…but one of my favorites–beautiful flowers on a lovely May Day! I am the happiest when I do something for others. This morning, I created several surprise May Day baskets to hang on friend’s doors–each was created with the friends interests and personalities. So much fun to make someone else’s day a happy one! 1. When I woke up this morning the temperature was already higher than the forecast high, meaning a sweater would work in place of a coat! 2. The wind was blowing hard enough that the smell of lilacs from the bush across the street reached my nose. 3. It stopped raining long enough to get from my car to work. I haven’t created my Beautiful Life post, yet. But it is to come! Wow they are beautiful, trying not to covet here. =)) What makes me happy is hubby, coffee, my kids, coffee, the beach, coffee. =) You get the idea. 1. A little moment of quiet time with God on the couch every afternoon — just when I need it most. 5. A big cozy hug from hubby. 10. Clapping hands and saying, “Yay!” with M&M (my baby girl). 13. Our sunroom and spring making a perfect match. 19. Making memories with J and the kids. My girls Isabella & Sofia. Children change your life for the better. Happy that we always have food to eat and home to live in. That my daughter is going to a Great school. Happy that I have the opportunity to be a stay at home Mom. Happy that a great opportunity for my bow business could be right around the corner. I will find out next week. seeing my 2 children smile, learn & grow is such a simple pleasure. I am blessed that we live in an area that is unaffected much by the economy. We do have our school’s closed with two cases of Swine Flu in our town. What makkes me happy? That I get to spend time daily with my kids and see them grow up. That my roses are blooming. That my God is always faithful daily. Dishes, listening to my kids laughing hysterically, my guest room (sunny yellow, big tall 4 poster bed, quilts – so comforting), that my husband has a job he loves, that my photography business is taking off, that my parents still live on the beach, the pink flowering tree outside my kitchen window, summer peaches, SEC football, farmers markets, fine china, silver and crystal… I could on! and I can’t find Mr. Linky on either post. You inspired me to write a long over due post of my goals! Thank you…I needed this. And i love dishes. I have an addiction. They make me happy and I won’t quit! Ooh, I’d love to enter! What makes me happy today? My husband is on vacation for the next five days and will spend them all at home with the Little One and I. And we get to see far-away relatives this weekend whom we’ve missed a lot. Happy, happy! I am happy that I get to visit my inlaws in sunny Florida this weekend. I am blessed that my sneezy cold is just that…and not the swine flu. I am thrilled that it is springtime and grateful for joy in my heart. I’m happy when I look out my windows and see the beautiful mountains that surround our home, when I sit down to dinner with my amazing family and hear about their days, happy that I get to work with people who are wonderful and passionate and creative, that I have a wonderful best friend (even though I don’t get to see her nearly enough), and happy that there are wonderful moments of beauty all around me every day and that I appreciate them enough to take a moment to enjoy them. Just went to see the Magic Brush post and it was just the laugh I needed this morning. Seems like something that would happen to me, so I could relate! 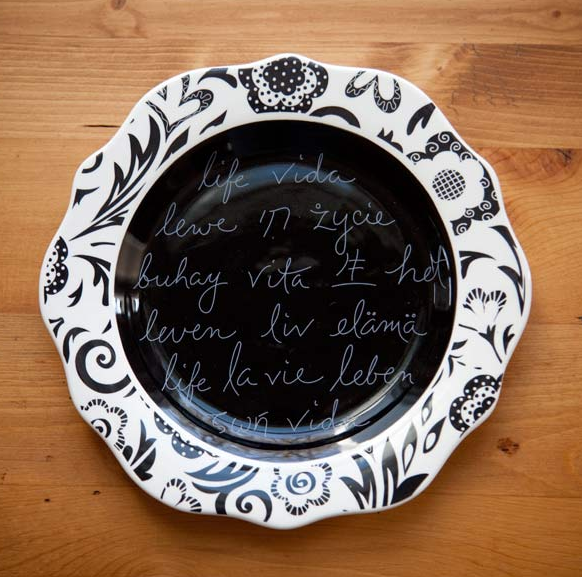 What pretty dishes, and what a fun giveaway! It is the little things that make me happy these days. Watching my daughter sleeping (she turns 10 tommorrow and I am still trying to soak in every bit of her), getting a good deal at Walgreens, finding a parking spot right up front, free samples in the mail, not to mention a good cup of coffee and watching the Gilmore Girls. Seeing everything outside turning green and hearing the birds in the morning makes me happy. Add some sunshine and things are nearly perfect! What makes me happy now is a clean house, the beautiful spring buds and sleeping children. Reading my blogs with a Starbucks latte, long walks on the beach, sewing with all these beautiful fabrics, dinner for two with my honey. These dishes are so trendy and cute. I have a daughter who they would be perfect for! When life gets me down, I have a window seat I love to go to. I linked up with Mr. Linky to a post I recently did on the window seat, and stepping away from it all and just looking out the window. 2. An end to the rain. 3. $37.65 worth of perennials. 4. Our two new cats, Ralph and Buddy. 5. Big plans to go to Jo-Jo’s Pretzels tonight with friends. Hearing my son’s laughter makes me so happy. He’s a precious little guy and I’m so thankful that even in the midst of some “stinky” life stuff going on in our lives, he’s joyful. 1. My 5 year old daughter using the word “familiar” in a story she told yesterday. 3. My hubby calling me 4 times since he left on his “boys weekend” yesterday to tell me he missed me. 4. My girls running back to me to give me “one more hug” before they get on the bus. 5. The penny I found at the market yesterday…. 1.A good cup of hot tea and reading a great book. 2.Healing faster than anticipated from a broken femur! 3. My husband making me laugh. S0000 many more precious things. This time of year makes me especially happy as the snow is finally melting, the days are so nice and long and most of all…the garage sales and flea markets are starting up again WOO HOO! When I truly stop and look around at all that God has Blessed me with, it makes all the stress and bad things going on in the world go away. I have a beautiful home, amazing husband, friends and family, and my health. What else do I need? BEAUTIFUL stuff, I am in love with these new pieces! In spite of the worries of the world, we are so blessed! The faces of my children, the love in my husband’s eyes, the beautiful words that I read through out my favorite blogs – God is good and today is going to be a great day! Angie @ The Creative Mamas inspiring blog post..Taking the focus off of fear. My family. They make me happy every single day. What a cheerful post. I’m especially happy because we moved our son Eric back home from college and he graduates with his masters on Saturday morning. Morning prayer, coffee on my deck, the rain that is making my new grass grow and my transfered hostas take hold, and so much more make me smile and feel a warm glow of happiness! I added my list to Mr. Linky! And I subscribed via email, though I already get your RSS feed through Google Reader. I hope I didn’t mess something up! Being inspired by others’ creative frugality. This is great! I could go on. Thanks!! I love when my 15 year old Daughter makes me laugh. I love when my about to be married Son gives me hug and says I miss you Mom. I love that Trader Joes had Daffodils for 1.29 a bunch and they are gorgeous. I love that through Facebook, I found a family member I had not spoken to or seen in over 20 years. What a great post, Melissa. I think that list is just perfect. I am very happy knowing that I get to see my family this summer and that I get to see them just as much as I want. It was hard enough trying to find a time when we were all awake and home to even TALK on the phone when I lived in Germany. Thanks for a shot at this prize. Healthy kids!!! Love the dishes. Yes, there’s so much to cause us to worry these days – the economy, the swine flu etc, but when I remind myself of the ONE who never changes, now that gives me confidence and peace. Thank you so much for offering this wonderful giveaway! What a great line of plates. I am the type of person that needs something like that to daily remind me that God is in control and that He desires to give us abundant life! It is so easy to be bogged down with all of the bad news about the economy and this crazy swine flu, that we sometimes forget the little things in life that make it wonderful! I am blessed with loving family and friends. I have a home, food to eat, and clothes to wear. My husband has a job. We are greatly blessed! 10. finding a good deal! And those dishes would make me happy too! so, I thought that I just posted a comment, but apparently…didn’t happen, because now I cannot find it. So, I will try again. My kids make me happy. Knowing I brought them here in love, watching them sleep, cuddling with them in the morning, hearing their laughter. There is nothing I treasure more. Flowers make me happy- my husband and my girls gave me overflowing bouquets for my birthday. Texas bluebonnets in the Sping make me happy. Finding the perfect dress or pair of shoes on sale-makes me almost sublimely happy. Answered and unanswered prayers make me happy. Oh, and not catching the swine flu, that would make me happy too! I am happy… my pregnancy is easy, my husband is a hard worker, the sun is out today, and I am healthy!! What a fun post and great give-away! I loved your 20. Simple, not frivolous & “good”. What is making me happy today is knowing I was able to cancel my daughter’s SAT’s for tomorrow & not incur a re-scheduling fee!! Sounds silly I know. I felt I was being perhaps irresponsible for having her go when a lot of the school districts here are closing the schools for a few weeks due to the flu epidemic. But then there is the Prom tomorrow too. Life is never easy. I think it’s time to smell the coffee!! Have a good weekend & we’ll just keep thinking about the 20 things! Very pretty dishes…I certainly had fun posting pictures and comments on my blog this morning. Filling my outdoor pots with greenery and flowers, knowing they will be overflowing by summer makes me happy! Just by chance my 16 year old son had a poetry assignment last night. He wrote a peom, “What Makes me Happy” it was so beautiful. It made me more than happy to know that he can find happiness in his life. I’m happy that my whole family is bound for heaven because of what Christ did for us. And I’m happy that you gave me the push to paint something, because within the next 2 weeks my front porch won’t be ugly any more. Love the weather outside, love the idea for the post (it’s always good to be thankful for what you have), love the give away! Especially the red, white, and black dishes. Love them! 5. Book club with my friends. Things that make me HAPPY – My 2 precious grandchildren, my 2 precious daughters, the opportunity to sponser a child through COMPASSION to bring some happiness to their life, the fact that I still have a job teaching piano lessons to children, that I am relatively healthy, and that GOD is in control of my life. BLESSINGS! kristen – gock’s frockss inspiring blog post..
laundry washed and put away. sarah’s dandelionss inspiring blog post..How many kids live here? I’m redoing my bedroom this weekend! I’m talking a vacay in 2 weeks! I’m so blessed by so many things. Today I’m blessed with a great friend who has the most precious son Drake. She is getting ready for the 4th annual Drake Taylor Invitational to benefit Cerebral Palsy. So much good has come from this….lets all make it the best year yet. My neighborhood – so many nice people, so many families; it’s exactly as I would have dreamed. My boys – twins, first year was so hard but now that they are 4, so happy to have twins. They play together and say the cutest things to each other. Love to just eavesdrop. My garden – it is actually growing and I haven’t killed any of the plants yet! I am happy for… my faith & my very supportive husband! I’m looking forward to the movies with my three guys this weekend! Love your blog! Things that are making me happy right now…. -only 19 days of school left (I’m a teacher)!! amys inspiring blog post..Let’s go fly a kite…. Good music, good food & good friends! Those always help in the happiness department no matter what’s going on in the world. Today is my husband’s last day of school and he graduates from college next Saturday! *Phone calls from my daughters that are 6 hours away. *Sophia, my dog, she thinks I am perfect. *Swimming in a beautiful pool. *Long dinners with family and friends. *Payday, yes I am grateful. *When the Canadian Geese fly low directly over my house honking. *Life, breath, sight, sound, taste, scent, and touch. My sweet baby yellow lab makes me happy. My wedding in two weeks makes me excited!!! And I agree with the many previous mentionings of coffee, naps, long walks, pretty weather, etc. Now I am smiling! Thanks for the reminder that life is amazing. It makes me happy to see the animation in my boys’ faces when they tell me a story. the list can go on and on. thanks for the great drawing. My happiest thing today is that I just found out my daughter was hired full time! That’s a seriously happy thing. These little Sweet Stands make me happy. I made them last weekend and I will entertain Mom for brunch soon for Mother’s Day with them. Can’t wait! After a season of seemingly constant illness in the family, we are thrilled to be well! Also, we live on monthly support as missionaries in Germany. We are so grateful that our supporters have been so faithful in this rough financial season. Of course, a sunny day, blooming flowers, a great view while washing dishes, and good songs on the radio via internet make me happy too! It’s all about the little things at my house this week (mostly because the big things aren’t getting done ~ lol). I was thrilled to have finally made some bags that I’ve been thinking about for months! Oh i would love to be entered, i collect fun dishes! My recent happy thing was just putting all the “Busy” life aside to build tents/forts our of blankets in our living room and pop some s’mores under our broiler. We went camping in our living room and of course the kids never wanted it to end. Watching them think it was so cool and fun made me feel very happy and well worth putting all else aside! Going to do this kind of thing more often! Julianne Bells inspiring blog post..Are You in Denial? My bible and God’s words in it bring me great hope. Get a pedicure and wear flip flops. visit with my husband and catch up on our day. I love warm weather and everything that it brings – walks outside, dresses and flip flops, reading and dining outside, and sun tans! my favourite home, family and decor blogs (like theinspiredroom) that give me so much inspiration and encouragement. 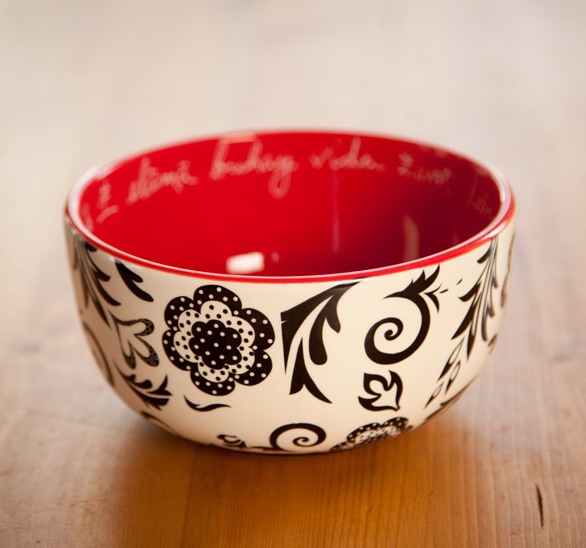 Thanks for the chance to win the Dayspring dish gift certificate, the collection is beautiful. These dishes are really beautiful. whoops, sorry for the 2 typos! 1. My boys coming home from school. 3. Coffee with my hubby in the morning. 4. Friends who drop by for tea. 5. the wonderful teachers at my son’s school. 6. puttering around the house ALL DAY! 7. being inspired to try a new project. Seeing all the signs of spring make me happy! Stephanie Bs inspiring blog post..Look What I Won! courtneys inspiring blog post..a baby story! it’s warm! sometimes that’s enough…. so happy to be with my husband…he got in a wreck this week that totaled his car, and I’m so happy he’s fine! I am happy that my daughter is almost finished with her first year away at college and soon she will be home for the summer! Hot tea and a bath, in no particular order, always cheer me up! What a wonderful giveaway and beautiful dishes! What makes me happy? What makes me happy is no school and wandering through 40 acres of tulip fields! A week at the beach with my husband, daughter and family begins this Sunday; for that, I am so grateful. Seeing my daughter at field day today. Her best place was 4th and she said that it doesn’t matter – she told me that field day was about having fun! I couldn’t stop smiling! I love these plates. So beautiful AND inspirational. I hope I’m a big ole weiner, but just in case, I’m checking their site and making my wish list. I am happy that I don’t have to worry about the crazy media and the way it is spinning all of this flu stuff out of control because I know the GOD who controls ALL things! Jens inspiring blog post..Show Us Where You Live Friday….Kitchen Edition! I’m glad I was able to link up my dessert memories post today – I do think that taking time to enjoy special memories makes our lives more beautiful! One of my kids and family are moving back after three years of being across country from us – yah! I am posting about the giveaway over at The Green Greek, including my own list. With thanks for the giveaway. (They ARE really lovely). Happiness… my daughter saying her ABCs, sitting on the couch with my husband doing absolutely nothing, hugs, lots of them, and chinese food. Oh, General Tso chicken and fried rice! 20 happy things….what a great idea! Thanks for letting me post at your party! Lindsay @ Peacock Blues inspiring blog post..20 things…. Hanging out with friends around the pool on a Friday evening, borrowing books from the public library, and tucking my kids in bed after a long day are some of the things that made me happy today. Clean sheets and shaved legs–you know the feeling! Besides having an amazing husband and wonderful, healthy girls, I am most thankful that I have the Peace that passes all understanding, believing in Jesus and knowing my life is in His hands regardless of what the world is doing/saying/fretting! My grandbabies smile whenever she sees me. Jennifers inspiring blog post..I’ve become a Blogaholic!!! Well let’s see… There really are many if I just stop and think about it. I LOVE coffee makers with timers so coffee is ready first thing in the morning. I love cool spring weather. I love text messages from my girls. I love my Westie’s face after she rubs it on the carpet. I love my husband’s integrity. And I love blogs! Oh, and I LOVE those dishes!! My blog has become more popular. a grandson’s hug, time with my family far away, walks with my spouse, bible study group, prayer, laughter…. What makes me happiest is my beautiful family – my amazing and very handy husband, Rob, three beautiful children — Melissa, Matthew and Summer, with children of their own – Sam, Eli, Laryn Brooke, Hudson, Mattie Claire and Ailey Kathryn – funny, healthy, happy grandchildren froclicking in my hydrangea covered back yard – another happiness– gardening and cooking for this wonderful brood. Our home is full of life and Daysprings beautiful new set would be a welcome compliment to our lives already brimmining with abundant life! Those are simply GORGEOUS dishes!! Some things that make me happy right now? TidyMoms inspiring blog post..In Full Swing – priming finished! Seeing the sunshine after a week of gray and rain. I find happiness in the knowlege that I am a child of God. My dog makes me happy! I have so much to be happy and thankful for. One of the biggest is my husband. I can’t even put into words how wonderful that man makes my life! Thanks for hosting yet another amazing giveaway! Waking up each morning to a brand new day, endless opportunities, smiling, the color orange, hugs…new dishes! Coffee … oh, wonderful coffee. Cappucinos, lunch out with my friends. Movie night with my kids. Date night with my hubby. Reading your blog!!!! :o) Those are all things that make me happy! I am happy that my hubby has a stable job! The world will always need teachers! My faith, family and friends make and keep me happy! Hi there! I just wrote a post…thanks for the inspiration. And I just subscribed to you via rss. You have some great ideas here. Some things that make me happy? I just wrote that here. I love my husband and am so grateful for his wonderful spirit and attitude! My husband getting out of the Army this past year after 8 years, and me getting to wake up every day with him. THANK YOU MELISSA FOR THE HEADS UP. I LOOOOVVVVE THIS LINE!!! I MENTIONED IT ON MY BLOG FOR ALL TO HAVE A CHANCE TO ENTER. My faith in the Lord Jesus Christ and my family fill each and every day with joy! Each day is a new beginning and more time given to me to be able to let them know how much I love each and every one of them! Hi Melissa, I’ve added my post to Mr. Linky. I love this collection from DaySpring and would love to win. Thanks for inspiring each of us to focus on positives and things that make us happy. Life is good, we are blessed everyday. Good music, good food, good company makes me happy. I wish you all the blessings in the world!! You are always putting our brains to thinking — I blogged bout how music can take me back in time where i was a cute (uggh maybe not so cute) early teenie bopper — those were happy times. Thanks for the happy reminders! 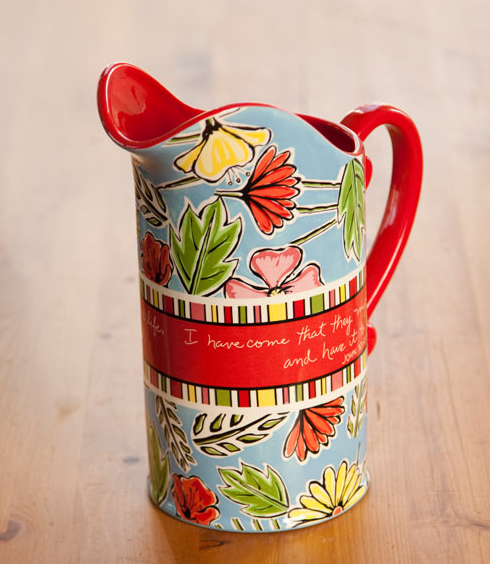 We love ANYthing that encourages, so Dayspring is right up our alley! Thanks for sharing this post. One more thing that we love that celebrates life….hmmm, surprise one-liners written on the bathroom mirror, sent via text, put in wallet/ purse….all the above! HEAVEN SOWNs inspiring blog post..The Beautiful Life! Whew… it was hard to come up with a list, but it was soooo important. Thank you again for this series. It has really been fun and challenging. I added my post tonight. things that make me happy, which I try not to take for granted: My loving husband, my quirky family, my crazy cats, my close friends (even though they are far away), my many wonderful books. I am grateful for my health, my family, and coffee………. The rain tapping on the metal roof outside my bedroom window. The sound of my boys laughing. Seeing my puppy play ball. She loves to play ball. 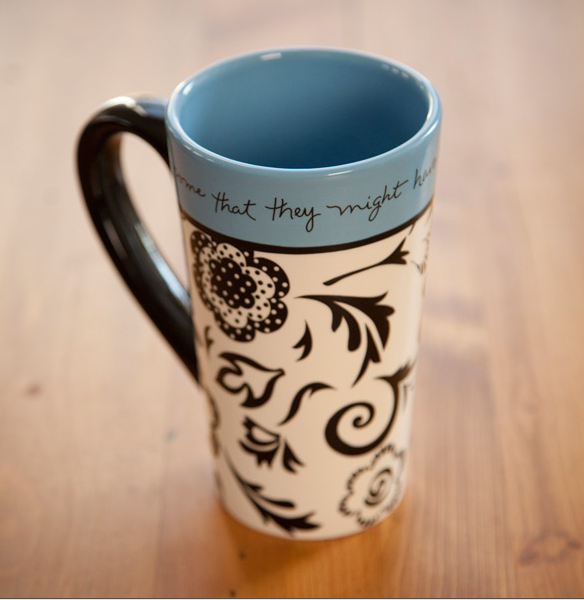 A big ol mug of hot cocoa on a cold morning is a special mug that makes me smile. Sorry I forgot to add the link to my blog on the previous post. The thing making me happiest right at this very moment is feeling the little kicks from my baby. He’s been pretty active today! Jo – To a Pretty Lifes inspiring blog post..New Baby, New Furniture, and Garage Sale Season is Here! Things that make me happy: rainy days, hot coffee, new clothes, my little girl, my dogs wrestling. Mrs. Petries inspiring blog post..Blog Tag- I’m It! Watching new baby goats frolic across their pen. Running as fast as I can down a dirt road. Seeing the sun come up over our fields. The fact that I have a house, food, family, and love. I think the biggest thing making me happy right now (even with the swine flu thing) is that I get to fly home with my little man tomorrow, to spend some time with both sets of grandparents, as well as take his first trip to the beach! I can’t wait to have some professional pictures taken, spend time with family that I haven’t seen since my wedding, and buy all those little things that we don’t get overseas. I’m so pumped! Abbies inspiring blog post..A song. Or two. my husband, my kids, rainy days in bed, walks by the river & hanging out with my friends. I would love those red 6 inch bowls in red!!!!! They are so cute! My Blog about covers it -but FONTS make me super happy! They are so statement making and bold. I love them all and I had a fab weekend to boot! Just a few things that make me happy: my God, my hubby, my girls, my family, my friends. What a fun idea – I had a great time coming up with my list – and that collection is just gorgeous! Jen E @ mommablogsalots inspiring blog post..What Makes You Happy? A long-overdue project that is finally finished always makes me happy. When it turns out exactly as I envisioned it, then that makes me even more happy-lol. Happy things: my sweet little girls, the promise of God’s everlasting love, my precious husband, wonderful friends and family to do life with. Hi! Your blog makes me happy! Thanks. Jesus makes me happy everyday. So do God’s many gifts. Especially my caring husband and my wonderful, precious daughter. Family, friends, sunshine & the smell of freshly mowed grass. What a beautiful and colorful line of dishes! Bright colors make me happy! i’d love to win. I posted my happy things post!! I absolutely love pretty dishes – and they make me so happy! I also LOVE that I’m about to move in our “first” house – and the decorating makes me very very happy :) Very scared…but very happy!!! Thanks for helping us focus on the beautiful things (like pretty dishes!) that surround us each day. Ahhh, things that make me happy…nursing my baby boy, cuddling, fresh & clean sheets, putting a dress on my little girl, kissing my baby’s chubby feet, taking pictures, time with family, cookouts, seeing my kid’s smile, a weekend away with my husband, etc. I could go on and on forever about things that make me happy. Life is good. It makes me happy this time of year, to go to the park twice a week and watch my SIL play softball – there’s nothing better than sitting in a comfy lawn chair and squinting into the sun while cheering the team on! Tomorrow’s forcast makes me happy. After 11 days of rain it is to be dry tomorrow……woohoo! Also we found a terrific homeschool group to join in the fall. Life is good. My children are happy and healthy, my 4yr. old daughter made it through a wreck this past Saturday and I’m happy happy and grateful grateful!! Life is good. Sunshine, spring flowers, date night, my children getting along :) I think when we stop and really think about our day we can find hundreds of things that went well verses a few things that went wrong! p.s. I love, love those dishes!!!! Emilys inspiring blog post..Who doesn’t like free stuff? Cuddling up beside my husband in bed, sunshiny days, chirping birds, laughing.